About 26% of men and women who groom their pubic hair have been injured at least once, according to a JAMA Dermatology study published Wednesday. Of that total, 32% said that it had happened five or more times. Injuries ranged from minor ones like razor or wax burns, irritation and hair follicle infection to more major and common ones like lacerations, burns and rashes. Medical attention was required in a small percentage of cases, or 1.4%, the study found. Because pubic hair grooming — defined as removing some or all of a person’s pubic hair, whether with scissors, wax, a razor, laser hair removal or some other technique — is so widespread, the study speaks to the need for injury-prevention efforts, such as clinical guidelines or safe grooming recommendations, the authors said. Unsurprisingly, many more women reported grooming their pubic hair than men (85.2% vs. 66.5%). 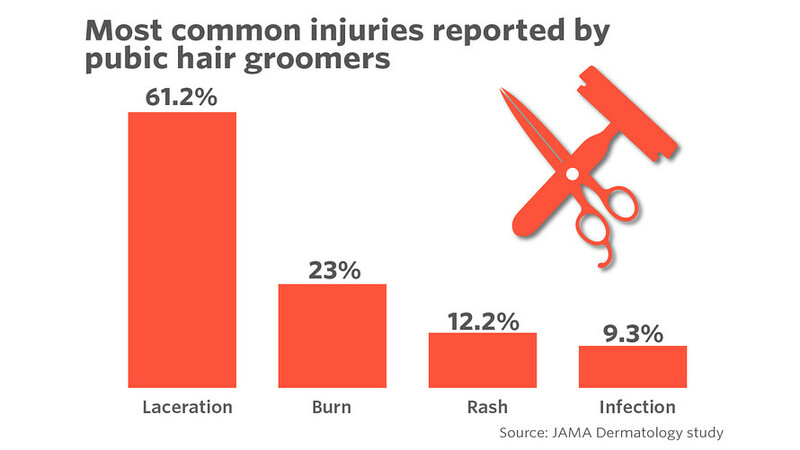 More women than men had a history of grooming-related injuries (27.1% vs. 23.7%).